If ever there were art music disguised as downtempo broken beats, it is Paul Crocker‘s Equilibria, recorded under his Dustmotes moniker and released for free download by the estimable dustedwax.org netlabel. On “Inner Tuning,” a mix of plaintive violin, post-rock exotica percussion, and a soundbite recording of a crime report all collide into a dramatization that’s less about narrative and more about frozen time (MP3). Early on, a slowed-down siren makes its way from one ear to another. At first, it’s just an effect rendered for its sonorous musicality, but then it reveals itself to have been a premonition of ill deeds. It’s the siren you hear as an everyday soundmark of urban life, only to be confronted later by the specific stark reality of that siren’s meaning — noise revealed as signal — when you flip on TV after dinner. On “Sickle,” the individual parts of a fusion ensemble — trap drum, fuzzed-out guitar, gut-rumbling bass, light electric piano — flutter by like clips that are ever so slightly out of sync with each other (MP3). The effect is mesmerizing, and like one of Conlon Nancarrow’s famed player-piano works, challenges the primacy of human-performed music by presenting something whose very mechanical nature is an essential aspect of its rough beauty. If that is the goal of broken beat music, then “Sickle” reaches it. And those aren’t even the finest tracks on Equilibria. That honor would arguably go to “Train” and “Oil Face,” both of which take brief snippets of existing recordings and transform them into the lead “voice” of fully considered compositions. In the case of “Train” it’s a snippet of a horn solo that appears on occasion above a bed of pizzicato plinking. It’s a dirge of a solo, each time around slowly pushing toward its conclusion. The repetition of the recorded — again: frozen — performance is in stark contrast with the emphasis in jazz on live playing, yet the affection inherent in the sampling — sampler as custodian — is undeniable (MP3). On “Oil Face” it’s a tiny bit of a female folk vocal, heard as flittery wreckage, its verbal content unintelligible thanks to thick vinyl static and enough scratch-induced stuttering to suggest a turntable-induced stammer. When, about a minute and a quarter in, the track suddenly explodes with a pop exuberance, what’s heard is a song despite itself, a song that has managed to utterly dispense with the whole concept of lyric meaning, and still manages to combine voice and production into something elevating and intoxicating (MP3). It’s only June as I type this, but if Equilibria isn’t on my best-of-2011 list it’s only because some seriously tremendous music arrives between now and the end of the year. Get the full album, 11 tracks in all, for free download at dustedwax.org. 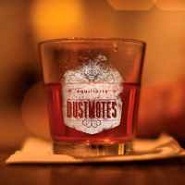 More on Dustmotes/Crocker at dustmotes.net.